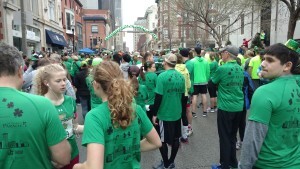 Baltimore’s Shamrock 5K is one of the three races that make up Charm City Run’s B3 Challenge. It’s also one of the most popular races in Baltimore because it’s family-friendly, ends in a party near the Inner Harbor with beer and a fun cover band, and is immediately followed by the St. Patrick’s Day parade. Since I want to focus on shorter races this year and several ladies from my wine club were going to run it, I signed my husband and I up. My training plan happened to call for a 3-miler the same weekend as the race. I haven’t specifically been training for speed in shorter distances—I still need to keep up my endurance for a few longer races on my calendar this Spring. But that was OK because I really just wanted this race to be a baseline so I can compare my progress for the rest of the year. Many races run by Charm City Run don’t have a specific expo. Rather, packet pick-up rotates between several of their stores throughout the Baltimore region. I stopped by the Annapolis store after work one day to pick up the bibs and shirts for my husband and me. Each runner got a green tech shirt with the event logo. There were men’s and women’s cuts, and probably half of the runners wore theirs for the race. The temperature for the race was forecast to be just about perfect for me—overcast, in the 50s, with just a slight breeze—but we were also expecting rain. Most of my weatherproof gear would also cause me to get warmer than I wanted while running, so I opted for a tank top, capris, and waterproof shoes. During the race, this combination seemed to work well. But when the rain moved in after the race I definitely felt cold. For this race I decided to not carry hydration with me because it was short and I knew I wouldn’t really need more than what would be offered at the water stop. 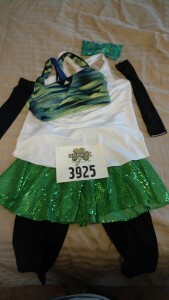 My outfit was: green Sparkelight Basic Sparke Skirt, black Sparke Skirt MuddBusters capris, black Fabletics tank top (different than the one in the “Flat Me” photo), blue/green/yellow Adidas sports bra, black arm sleeves, green Hippie Runner headband, Injinji socks, Brooks Adrenaline GTX 11 shoes, Garmin Forerunner 620 watch, and Gymboss interval timer. The race is a point-to-point course. We arrived early so we’d have enough time to park in one of the garages downtown and walk to the starting line. We decided to park mid-way between the start and the after party, though this put us on the wrong side of the parade route when we were trying to leave. So if I ever run this race again, I’ll park on the other side of Charles Street. We arrived in plenty of time to get to the race and had about an hour to kill. It was a little too cold to just stand around, so we strolled around the block to loosen up our feet and legs. 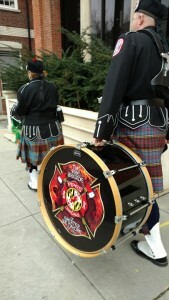 The race has a late start time (about 1:00 PM) and some of the churches in the area were just letting out from their special St. Patrick’s Day services, filling our walk with bagpipers and other musicians in full traditional dress. About 45 minutes before race time two things happened: 1. It started to rain, and 2. I really had to go to the bathroom. We observed a bunch of runners leaving the starting line and heading back toward Mount Vernon Place. I had no idea why—it’s not like there was a runner’s village or tents back there—until I saw everyone was headed in to the Walters Art Museum. The Walters is a free museum that happens to be open on Sundays. 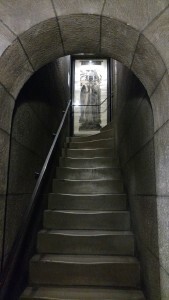 I’d never visited it before but since they were kind enough to welcome hundreds of wet runners into the building, we took advantage of the time to use their restrooms and wander through some of the exhibits. If you ever find yourself in the area with some free time on your hands, I would highly recommend a visit to the Walters. About 15 minutes before the race, we ventured out of the museum to head back to the starting line. On the way we noticed that several parade floats were staging in the area. One of the fun things about this race is that the runners more-or-less run the parade route, so not only do we get to see the floats and musical groups as they get ready to go, there are a lot more spectators then you would usually have for a 5K. As we strolled up to the starting line we joined a sea of green runners, listened to a recording of the National Anthem, and were off! I was a little confused at the very beginning of the race. We crossed under the banner marking the starting line, but there was no timing mat. I knew it was a chip-timed race, so I wasn’t sure what was going on. It turned out that we had to go about a quarter of a block before we crossed the timing mat; unfortunately I’d already turned on my Garmin so my watch and my chip were not in sync. This race starts on a downhill down Charles Street. There are huge crowds of runners and, due to the rain, the road was slick. Everyone took it pretty slow through a portion that in theory should be pretty fast. We continued down Charles Street and then went around the harbor toward Federal Hill Park. We eventually turned around to come back through the Inner Harbor to end at Power Plant Live. The course is generally downhill or flat, with a few minor ups-and-downs near Federal Hill. Race Icon. The great part of the course is the people. 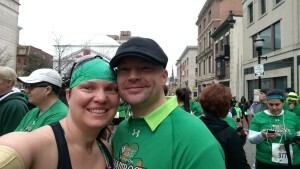 EVERYONE was in green…hats, tutus, sparkles, props…lots of green. And there were kilts. And people who pre-gamed. And dads with strollers. And a guy dressed as Forrest Gump. And a guy who ran in a kilt and while playing the bagpipes the whole time. If you’re looking for a party atmosphere and great people watching opportunities, this is the race for you. We don’t get medals at this race. 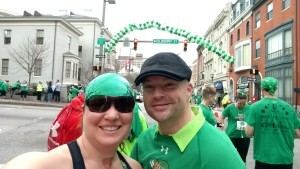 But we did get green beads with shamrock pendants as we crossed the finish line. By the time I was ready to enter the after party the lines for food and beer were a lot longer than I was willing to stand in. We did wander in far enough to hear the band for a couple of songs. But we knew the rain would be rolling in soon and we were starving, so we left the party to have crab cakes at Phillips Seafood (hey – we do live in Maryland!). By the time we finished lunch the rain was really coming down, but the parade was still going strong. I have to give props to the people who had been marching in the pouring down rain for 2 hours in full band uniforms and traditional Irish outfits, and still were putting on a show for the spectators. I had some great, fun music shuffle through my playlist at this race. My favorite was RuPaul’s “Jealous of My Boogie”, which was a great way to kick off the run. I would be happy to run this race again. Maybe next year it won’t be so rainy so I can stay to watch the parade.